I wrote this post a little too late. Rhubarb season is pretty much over, at least in Germany. If you are lucky you might be able to pick up a couple stalks, however. If not, why not save the recipe for next year? I definitely will, since this was my favorite rhubarb cake this year. A good indicator for a great cake is always if people who usually take care of their waistline take seconds, like my sweet cousin ;-). 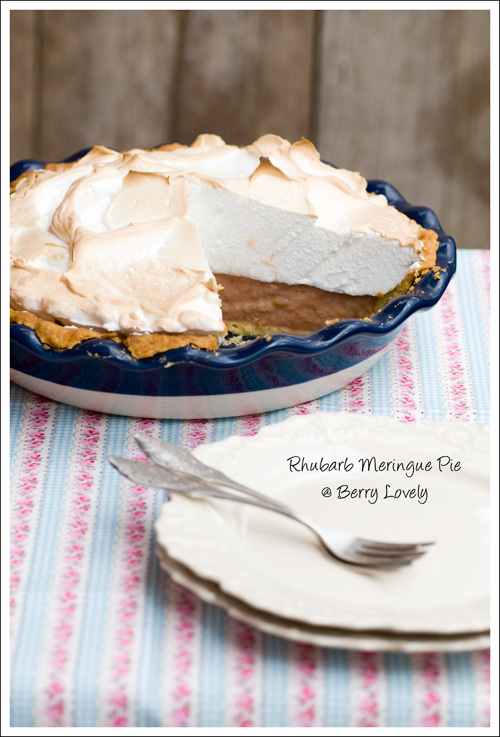 But the meringue is really heavenly and fits perfectly to the tart filling. The recipe I used is from Martha Stewart. The original recipe uses only the juice from the rhubarb, but instead I used the whole compote. Rhubarb falls apart after it is cooked, so it still gave a very nice texture to the cake. 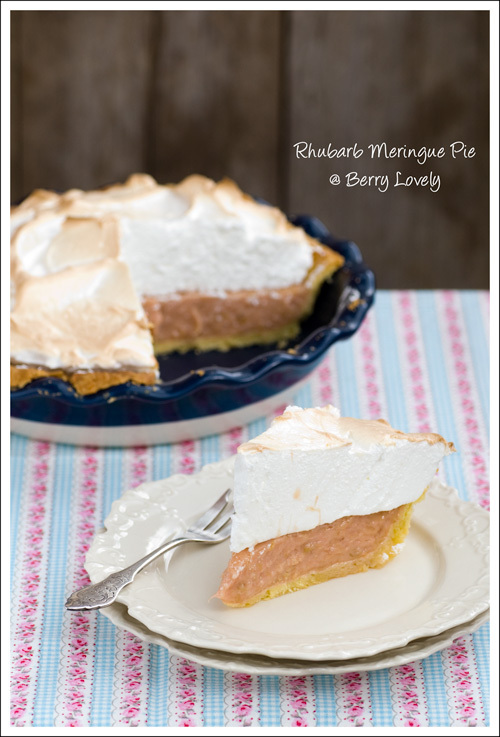 The cake reminds me a of a lemon meringue pie, which I always love, but when in season I will make the rhubarb version again. To make the shortcrust start with mixing the egg yolk with the ice-water. Pulse flour, sugar, and salt in a food processor until combined. Add the butter, and pulse a few more times until the mixture resembles coarse crumbs. Add the egg yolk mixture and pulse until the dough just begins to hold together. Shape the dough into a disk and wrap in plastic wrap. Refrigerate for about 30 minutes. Grease your pie form with butter. Preheat the oven to 190° C (375° F). Roll out the dough on a lightly floured surface to a round shape to fit the pie form. Prick the dough with a fork and put some parchment paper on top. Fill with pie weights and bake for about 20-25 minutes. Remove the weights and parchment paper and continue baking for another 5-10 minutes or until golden brown. Let cool on a wire rack. Place the rhubarb pieces with 100 g of the sugar and 1/4 cup of water in a saucepan over medium heat. Bring to boil, then reduce the heat and let simmer until the rhubarb is soft. Measure 2 cups (about 480 ml) of the rhubarb compote and reserve the rest for some other use (it tastes good on some vanilla ice-cream). Mix the corn starch with a tablespoon of cold water until dissolved. Add to the rhubarb and bring back to a boil, until the rhubarb thickens. In a bowl whisk together the egg yolks, then slowly add the hot rhubarb mixture while whisking. Return everything to the saucepan and cook until it has thickened. Whisk in the butter and fill into the baked pie shell. Refrigerate until set for at least 4 hours or overnight. Preheat the broiler in your oven with the rack on the highest level (without the cake touching the broiler). Heat the egg whites with the remaining 150 g of sugar in bowl over a water bath, until the sugar dissolves and the mixture reaches about 70° C (160° F). Transfer the egg whites to the bowl of a stand mixer and beat on high speed until medium peaks form. 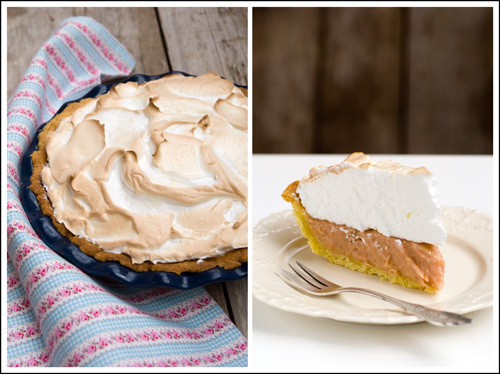 Fill the meringue onto the pie and put under the broiler for about 1 minute, until browned.